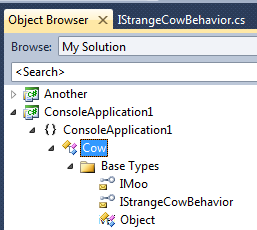 In Visual Studio, you can see which interfaces a particular class implements by using the Object Browser. 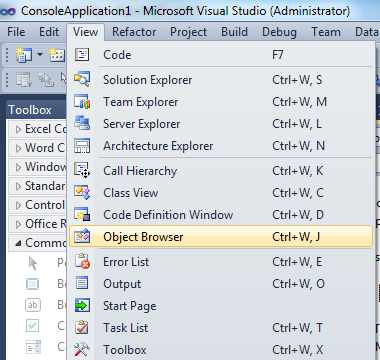 Open the Object Browser window by selecting Object Browser under the View menu. Once the Object Browser appears, you can navigate to the class that you want information on. 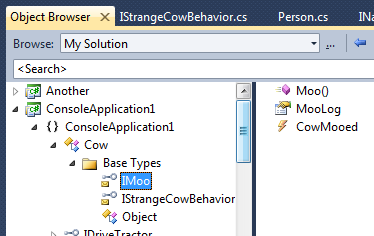 In the example below, we can see that the Cow class derives from Object and implements both IMoo and IStrangeCowBehavior. We can’t tell from this view, however, which interfaces are implemented explicitly, i.e. requiring an interface-typed variable to access the methods. You can click on the class itself to see all of the members of the class, including public and private members. You can see all members. Members in implicitly implemented interfaces (e.g. IMoo) show up as public members. Members of explicitly implemented interfaces (e.g. 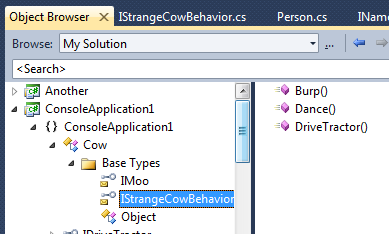 IStrangeCowBehavior) show up as private. You can also click on the interfaces to see members of each interface.